A Warlock's Luck is a magic shop located in the northern half of Bravil. 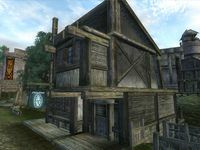 It is found across the street from the building which consists of Carandial's House and the Skooma Den. The proprietor, Ungarion, has 800 gold and a Mercantile skill of 40. When bartering, he will buy your clothing, food, books, apparatus and magic items and sell clothing, food, books, spells and various miscellaneous items. Among his wares is the unique Ring of Transmutation, which drains your Strength and Endurance while fortifying your Magicka. The main trading room is on the ground floor and consists of a counter, a dining table, a writing desk and a selection of Ungarion's wares on display. He lives upstairs as is usual with Bravil stores and houses. His private quarters consist of an antechamber used as dining room and a second room with a double and a single bed, although neither is available to sleep in. On the outside of the second story is a chest containing clutter, a lockpick and a small amount of gold which can be reached by jumping from the building in front. This chest is also non-respawning and therefore safe for storage. A handbill advertising the store is listed in the Construction Set, but cannot be found in-game. It would have read: "Wizard's beware! If you are using supplies from some place other than A Warlock's Luck, you may be taking your life in your hands. Don't compromise your spellcraft. We won't." The shop cannot be invested in after you reach 75 Mercantile. Esta página foi modificada pela última vez à(s) 21h42min de 30 de setembro de 2014.